If walls could talk. 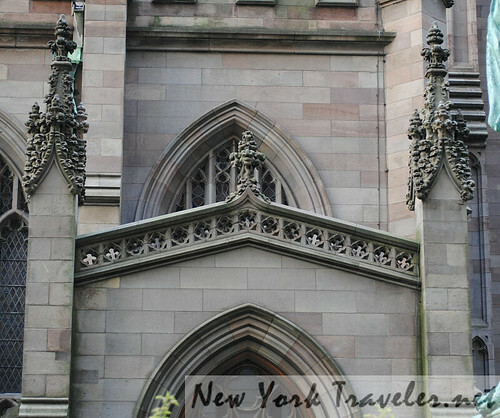 Located in lower Manhattan near “Ground Zero” from September 11, 2001, Trinity Church has seen a lot of action. 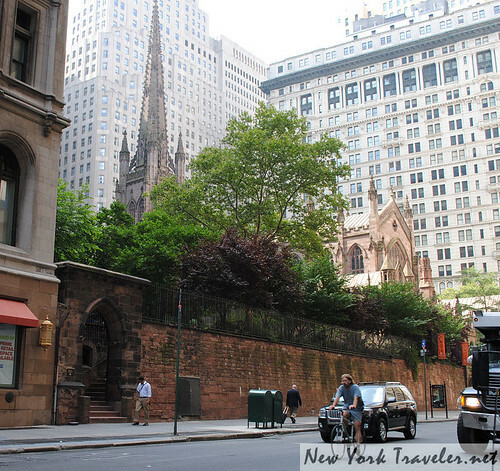 Built in 1698 when Manhattan Island was still a rural countryside just beginning to burgeon into a small town, Trinity Church received its charter from King William III of England in 1697. Trinity rented the land upon which it was built, in a contract supposedly from the descendants of a Dutch widow who had removed to Albany in Upstate New York after the death of her husband. The land has a history of contention. I own an old newspaper clipping from 1935 in which litigants sued Trinity Church for ownership of the land. According to what I have read (and there seem to be many versions out there, depending on who you ask! ), the plot of farm land originally belonged to Anneke Jans, a wealthy widow who had emigrated to Manhattan Island from the Netherlands. When she died, she bequeathed the property to her children and grandchildren, who leased the land to Trinity. 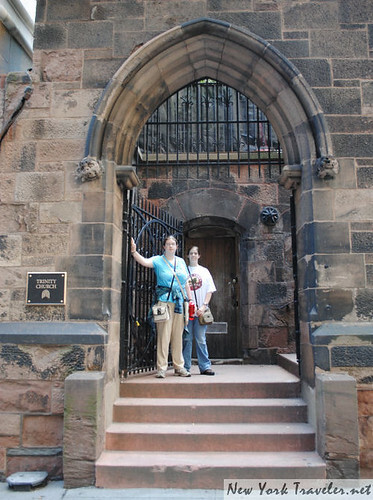 After a few centuries and numerous owners, Trinity Church considered the land theirs. Jans’ descendants sued Trinity several times over the years to acquire the rights to their property. 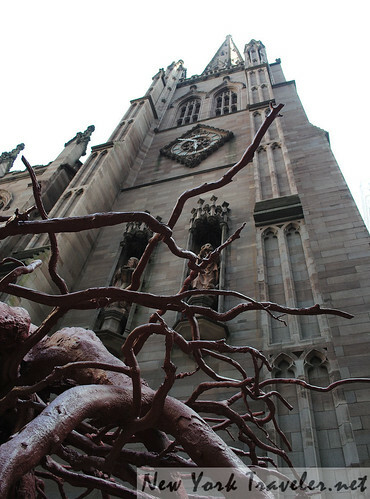 Every time, New York courts sided with Trinity Church. I think the final lawsuit was the suit in that 1935 newspaper clipping. Imagine if the litigants had won– the land is worth millions! Anyway, the first Trinity Church was a small, barn-shaped building. Legend has it that infamous pirate and church member Captain Billy Kidd loaned the builders his equipment to build the church. 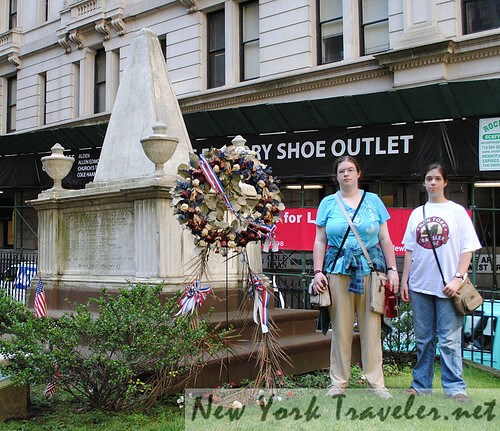 The building burned during the American Revolution, when fire raged through New York City. After the war, a second church was built. 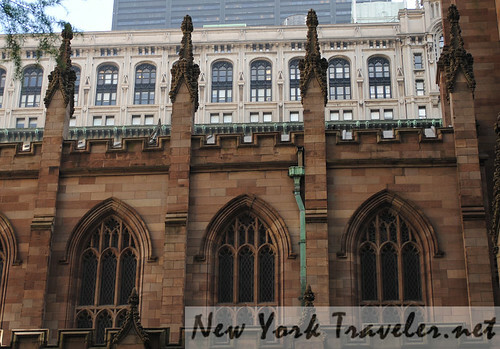 President George Washington attended the inauguration service at nearby St. Paul’s Chapel (post and photos coming soon!) while the building was under construction. Unfortunately, the building was razed in 1839 when it became damaged by heavy snow. 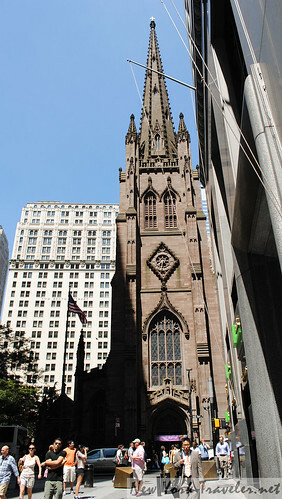 The current building — the third Trinity Church built here — was completed in 1846. At the time, Trinity was the highest point in New York. Today, the building is far overshadowed by the massive cityscape. The church is a wonder. It’s open to visitors, but is still an active church with services held regularly. The grounds are lovely. People snacked on their midday meals under canopies or enormous trees. Many others, including us, perused the graveyard in search of familiar names. 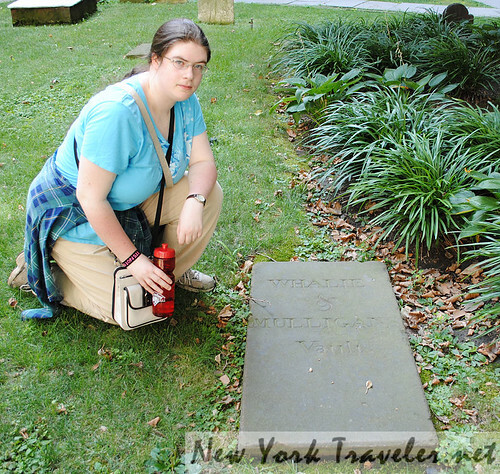 We paid our respects to our beloved Alexander Hamilton and wife Eliza. 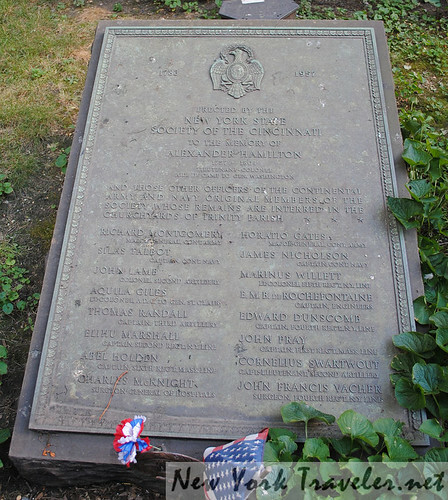 Hercules Mulligan was buried here. He was a spy during the American Revolution, a true hero. 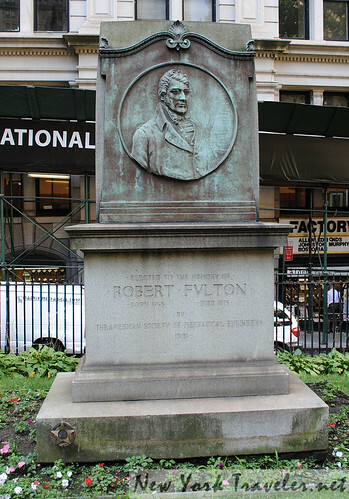 Robert Fulton is buried here. 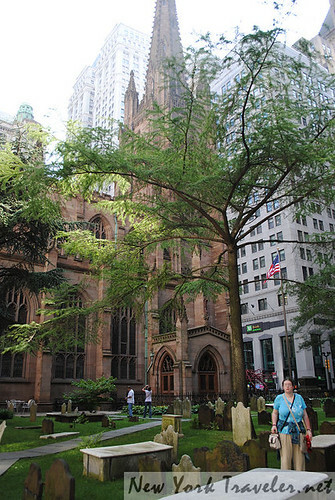 Trinity Church is located at “Ground Zero,” near the old World Trade Center towers. The church was undamaged, but an ancient sycamore tree was toppled. 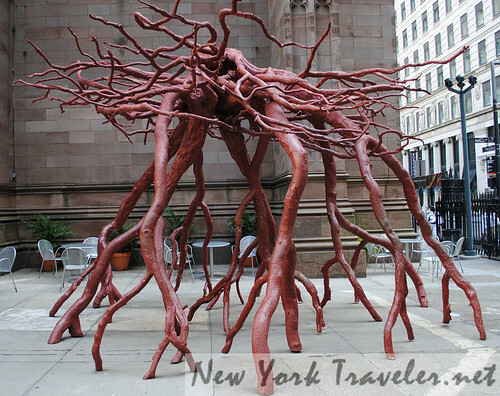 An artist preserved the roots of the tree and the church mounted the roots in the courtyard in memorial to the tragic events of September 11, 2001. The church is exceedingly majestic in its architecture. Awesome. It’s probably the closest to a European cathedral that I will get…. If you think the outside is stunning, wait until you see the inside! I’ll have loads more photos and some interesting anecdotes in part 2. As you’ve been dealing with eyeglasses, I assume you and yours are back home. Glad you’re not down there now, with the protest in Trinity Place.